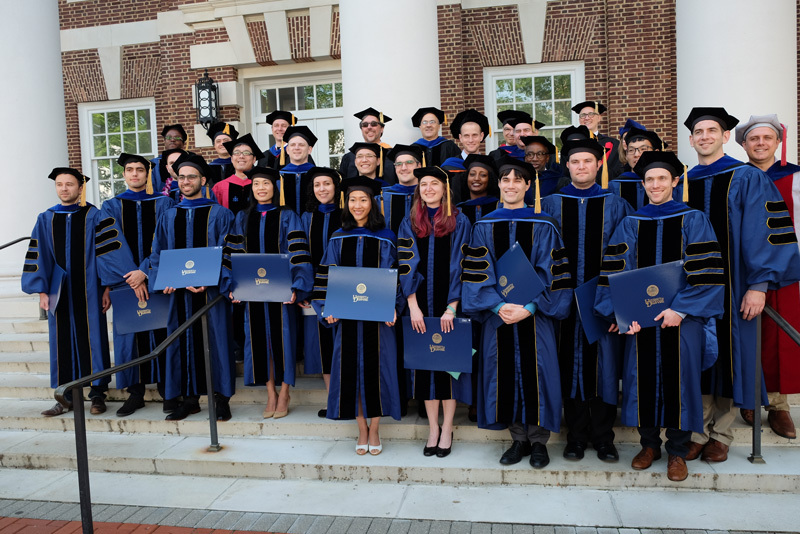 Two graduating doctoral students in engineering received prizes at the University of Delaware’s doctoral hooding ceremony, held Friday, May 25, for their dissertations. The culmination of long hours of research, meticulous documentation and analysis, these scholarly works present students’ original findings to a field of study, and to the world. Axel Moore received the Allan P. Colburn Prize in engineering and mathematical sciences for his dissertation, Independent and Competing Roles of Fluid Exudation and Rehydration in Cartilage Mechanics and Tribology. Moore’s research focused on the mechanics of human joint lubrication and its relationship to osteoarthritis, a condition affecting more than 45 million Americans. In particular, his groundbreaking discovery of tribological rehydration — the idea that movement acts to feed and hydrate the connective tissue, or cartilage, within our joints — enabling them to function better and longer is a quantum leap in understanding the relationship between inactivity and joint disease. “Most importantly, his results suggest that intermittent joint movement is the pump that restores and maintains tissue hydration … in other words, cartilage slowly deflates during standing and inflates during walking and other activities,” wrote David Burris, associate professor of mechanical engineering and Moore’s adviser. It is work that may someday inspire a new generation of biomaterials for joint replacement and other applications, according to Jason Gleghorn, assistant professor of biomedical engineering. “The test of time and additional experimental and computational analysis will bear out if tribological rehydration is responsible for how cartilage ‘works’ and if it’s failure is responsible for the progression of osteoarthritis; however, Axel’s new ideas about a problem that has baffled people for more than half a century speak to his critical thinking and innovation in the lab,” Gleghorn wrote. Dawn Elliott, Blue and Gold Distinguished Professor and chair of biomedical engineering, called Moore an “enthusiastic and valuable collaborator” whose seminal research prompted joint projects between multiple research groups across campus and led to two large federal grant submissions to study post-traumatic joint disease and explore potential physical treatments. Moore is only the second graduate student to complete UD’s biomedical engineering doctoral program. Christopher Long won the Theodore Wolf Prize in Physical and Life Sciences for his dissertation, Interrogating Bacterial Metabolism via the Mapping of Fluxomic Responses to Gene Knockouts and Adaptive Evolution. Long studied the ways that strains of E. coli bacteria adapted and recovered in laboratory tests when the researchers “knocked out” the bacteria’s ability to use enzymes critical to metabolizing sugar for energy. Maciek Antoniewicz, Long’s adviser and Centennial Professor of Chemical and Biomolecular Engineering, said Long is “one of the world’s experts in the field” of 13C metabolic flux analysis, an important tool in metabolic engineering that enables scientists to measure the cellular variations in a microorganism’s central metabolism. Long describes several new methods for the in-depth analysis of the normal functions that take place in a cell, and his study reveals previously unknown bottlenecks and areas of flexibility in an organism’s metabolism. His results constitute a significant new resource for the biological community, particularly in systems metabolic engineering, that can be directly applied to develop new models and strains [of bacteria] to engineer desired products. Long also was praised as a “wonderful teaching assistant” who devoted time to helping undergraduate students, others in the laboratory and colleagues throughout the broader discipline. Three UD grad students from outside the College of Engineering were also honored. They include: Alexander Ames, Wilbur Owen Sypherd Prize in Humanities; Kamilah Williams, George Herbert Ryden Prize in Social Sciences; and Felix Francis, Interdisciplinary Research Prize.